Smoking stuff is awesome; We’ve already established that. If chocolate can be smoked, why not olive oil? But olive oil is ruined by heat. Even “cold smoking” cheese can get up to 90 degrees, a temperature that can will ruin a good bottle of EVOO. So what’s a guy to do? If that guy is Kyle Payne, smoked food aficionado and co-founder / “Executive Dishwasher” at Holy Smoke Smoked Olive Oil in Charleston, SC (the “Holy City”, btw), he turns to his buddy Max Blackman, who, as Kyle puts it, “knows machines.” Max created a device to smoke the oil at a mere 37°, maintaining the oil’s inherent raw structure, and, more importantly, flavor and nutritional properties. What does smoked EVOO taste like? It’s buttery, especially when it’s young, a little nutty, and, well, smoky. The longer you keep it, I find, the smokier it gets. Though it’s not particularly appealing straight up – dipped with bread, or some other way I might enjoy my finest oils – it still has a myriad of uses. A simple and great way to employ it is on top of meat from the gas grill (especially burgers). Propane provides a great deal of convenience to all the weekend warriors out there, but there’s no denying the fact that we’re losing flavor without charcoal or wood fuel. A little Holy Smoke, however, and we’re back in business! 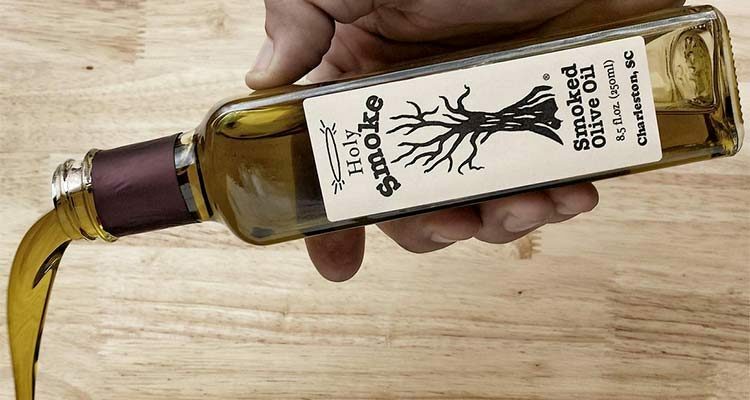 Interestingly, however, Holy Smoke’s marketing material takes a different direction – touting a meaty flavor without any animal products… like adding bacon to your dressings, dips and pastas without the guilt. And while I don’t know that it’ll fool anyone into thinking it’s really bacon, Holy Smoke does offer intriguing depth to vinaigrette, guacamole, hummus and more. Not sold? Grab a sample bottle for just a buck (+ shipping) from Holy Smoke’s website. They have bigger bottles too.